When I was young, I had a “15 Puzzle.” It was a plastic square with three rows of four square tiles each, plus a row of three with one blank space. 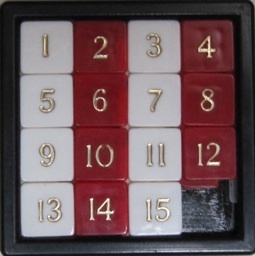 On each tile, was a number from one to fifteen, hence the name “15 Puzzle.” The object of this puzzle was to move the tiles around on the square until all of the jumbled numbers were in order. Why am I reflecting on a childhood puzzle? This has become a metaphor for the ministry I do with departing pastors, Search Committees, transitional ministers, and pastoral candidates. It’s a fairly simple object lesson of all of the sometimes complicated moving parts of pastoral and congregational transitions. This process includes helping the congregation and pastor who is leaving say goodbye to each other in healthy ways, putting a potential interim or transitional minister in contact with the church chair, orienting pastoral Search Committees to their work, forwarding pastoral candidates’ Ministerial Leadership Information (MLI) forms to Search Committees, and listening to the needs and hopes of numerous pastoral candidates inside and outside of Western District Conference. I find this work fascinating, and once in a while, like the 15 Puzzle, quite challenging, as well. This work is not linear, and it can’t be. Many of these transitional tasks are happening simultaneously, with one congregation’s Search Committee discussing multiple pastoral candidates at once, while pastors in search processes are in conversation with more than one congregation at a time, as well. Multiple, moving parts of complex discernment processes continue, sometimes for months at a time. Unlike a child’s puzzle, however, it is so much more than just my (and Heidi and Byron’s) attempts to bring order to seeming chaos. I trust that the Holy Spirit is in the midst of each congregational transitional discernment process. As each step falls into place—the congregation and departing pastor celebrate the ways they helped each other grow and develop and release each other, a transitional pastor agrees to offer this unique and vital ministry to a particular congregation for a brief time, and finally a particular pastoral candidate and congregation say yes to ministering together in the coming years—there is a sense of peace and rightness. There is holy affirmation that prayer and discernment on the pastor’s and the congregation’s part that this mutual “yes” will be the first step in a fruitful ministry partnership for years to come. For those congregations and pastors currently in transition, trust that I (and Heidi and Byron) am holding you in prayer and supporting you. For those pastors and congregations who are anticipating such a change soon, know that there are best practices for how to navigate these shifts, and that you will not face them alone. Then, in God’s own good time, all of the pieces will fall into place.